It’s going to be a good week for eating at our house! 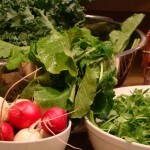 I’ve never had Salad Turnips or Pea Shoots and can’t wait to try out these new ingredients. I’ll be posting recipes and more pictures as I try them through the week.